This procedure is done to return a broken bone to its proper alignment. 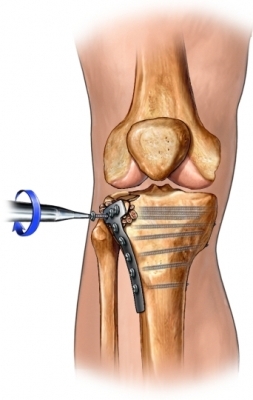 An open fracture reduction involves cutting through the skin to realign the bones during an operation. Screws and a plate or external support frame may be needed to hold the fragments in place. This procedure is used if the bone is in many pieces, is difficult to reduce, or wasn't reduced with a closed reduction. You may need to take antibiotics, if advised by your doctor. If you are at home, arrange for a ride to and from the procedure. Also, arrange for help at home. A incision will be made in the skin covering the break. This is to expose the bone fragments. The bone fragments will be moved into their normal position. Screws, a plate with screws, or a rod may be used inside the body or an external frame fixed to the bone fragments may be used to hold the bones in place. The incision will be closed with stitches. The area will be protected with a splint or cast and dressings. Another x-ray will be ordered to make sure the bone is in the correct position. This depends on the type and location of the fracture. You will have pain after the procedure. Ask your doctor about medication to help with the pain. Small bones usually heal in 3-6 weeks. Long bones will take more time. Your doctor may have you work with a physical therapist. Therapy can help you to regain normal function. Setting broken bones. Cedars-Sinai website. Available at: http://www.cedars-sinai.edu/Patients/Programs-and-Services/Orthopaedic-Center/Treatment/Setting-Broken-Bones.aspx. Accessed August 30, 2017. 10/30/2009 DynaMed Plus Systematic Literature Surveillance http://www.dynamed.com/topics/dmp~AN~T902789/Traumatic-amputation-of-the-extremity-emergency-management : Gosselin RA, Roberts I, Gillespie WJ. Antibiotics for preventing infection in open limb fractures. Cochrane Database Syst Rev. 2009;(4):CD003764.